While it might not be the first-person road crossing epic I crave, Konami's Facebook version of Frogger Pinball is an entertaining way to break up the hours spent sending funny pictures to your friends on Facebook, plus you get to play with frog balls, always a plus. Where is Our First-Person, True-to-Scale Frogger Game? 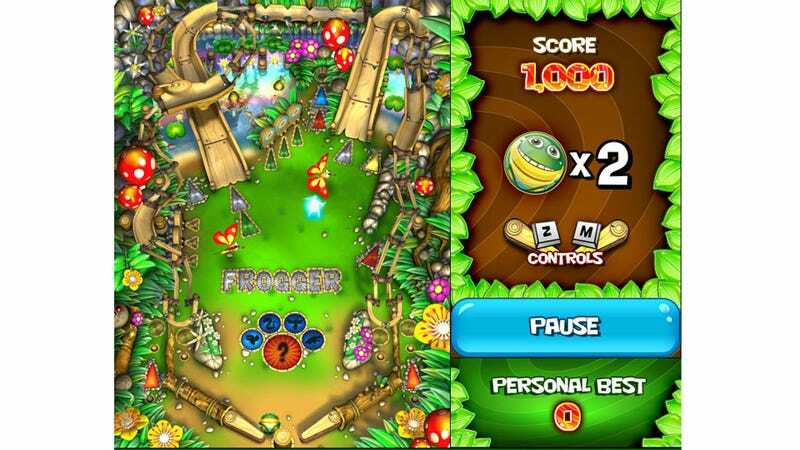 Accompanied by high-spirited banjo, fiddle, and accordion music, Frogger Pinball is either a quick pinball fix or an extended adventure, depending on whether you play the game's story mode or stick strictly to the challenge mode, posting high scores for your friends to beat. At first I was skeptical of stuffing an arcade classic into a pinball table, but then I realized I've been mostly pleased by such efforts in the past, from Sonic Spinball to Pokémon Pinball. Frogger Pinball was developed by Silverball Studios, the folks behind the Mario and Metroid pinball games for the DS, so they know a little something about capturing the essence of another property in table form. Frogger Pinball is also available for iOS devices.